Robust spring tax receipts have largely resolved a problem with the state’s credit card, sparing lawmakers from having to cancel hundreds of millions of dollars in planned capital projects. New projections from nonpartisan analysts show the state will exceed a key threshold in its debt limit system by $19 million on July 1 — a tiny fraction of the $522 million overage problem anticipated just a few weeks ago. That forecast, coupled with compromise legislation adopted Saturday in the Senate, also diffuses much of the disagreement over the state’s fiscal bailout of the city of Hartford. 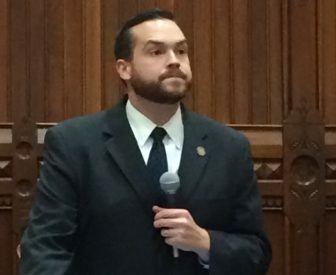 Miller, who is House chair of the legislature’s General Obligation Bonding Subcommittee, said legislators still plan to scale back borrowing, but they can avoid another major bond de-authorization effort. Legislators were stunned last month when they learned the state’s commitment to pay off $534 million of the capital city’s bonded debt would count against the debt limit. Lawmakers canceled or delayed close to $1 billion in planned borrowing in 2016 to address debt limit concerns. “It’s a positive sign, but there are still some cuts that need to be made,” said Rep. Chris Davis of Ellington, ranking House Republican on the Finance, Revenue and Bonding Committee. Connecticut has long had a statutory limit which counts both bonded debt currently outstanding and other borrowing that has been authorized, but not yet implemented. The state is prohibited from exceeding the limit — which rises and falls along with projected tax revenues. And the governor must develop a plan to reduce authorized borrowing whenever Connecticut exceeds 90 percent of the debt limit. The Hartford deal, state analysts warned in mid-April, would push Connecticut beyond the 90 percent warning threshold by about $522 million effective July 1. The legislature traditionally has responded immediately to projections exceeding the 90 percent threshold by scaling back borrowing. Gov. Dannel P. Malloy developed preliminary recommendations in response to that overage projection that included canceling $360 million in financing for school construction projects — most of which involved projects expected to start in the 2019-20 fiscal year or later — and $40 million in capital grants for hospitals. But things changed one week ago. Specifically, Connecticut had its most robust April for tax receipts in nearly a decade, according to a report analysts issued on April 30. Driving that report were quarterly income tax returns, which are dominated by payments on capital gains and other investment earnings. This portion of the income tax outperformed expectations by $1.3 billion this fiscal year. Analysts also increased projections for this revenue stream in 2019 by more than $400 million from an earlier forecast. And after adjusting for projected revenue growth, analysts said pressure on the debt-limit system has eased considerably. The bailout of the capital city also has sparked debate because Connecticut is expected to pay off the city’s debt over the next 20 to 30 years. And many legislators say the new state budget they adopted last October intended to pledge emergency aid to Hartford for just the current fiscal year and the next one. The Senate adopted a compromise measure on Saturday that would effectively end the bailout of Hartford after five years. After that point, the state would reduce non-education aid to the city each year by an amount equal to the emergency debt assistance.